This year, about one fifth of the district's new hires will be corps teachers. To the Oakland Unified School District, teachers are undoubtedly a precious resource. The metaphors, though, sometimes get a bit over the top. "You are like our diamonds, you are our gold," district official Allison McDonald gushed to a rapt audience of sixty Oakland teachers-to-be in Claremont Middle School's multipurpose room early last week. The district is looking for lifers: That is, a community of teachers willing to make a long-term commitment to the troubled school system. That's the purpose of the Oakland City Teacher Corps Training Institute, at whose opening ceremonies McDonald, a 27-year teaching vet herself, sprinkled the inspirational treasures. Only in its second year, the intensive weeklong preparation aims to build a select group of previously trained educators and arm them with additional instructional know-how. This year, about one fifth of the district's new hires will be corps teachers. As the trainees filtered in for the 8:30 a.m. start  the room's three clocks showed 7:00, 7:30, and 6:41  corps director Lisa Barrett and institute director Kilian Betlach completed their prep work in the school library turned corps office. Craig Kreutzberg sat in one of the blue plastic bucket seats near the front, wearing a crisp dress shirt, tie, and pants. Last year, his first as a teacher, he was a sub in the Detroit area. "I was neck-deep in the suburbs," he said. Although suburban Michigan offered a more functional school system  one not under state control he wanted a change in scenery. So Kreutzberg came to Oakland, where he had friends, and which happened to be the first place he was offered a job. Carole Valentino, in a blue felt jacket and beige pants, sat toward the rear. She had urban public school experience, but hoped to polish away the rust. After a four-year stint at Los Angeles Unified, she took an eleven-year break to raise her two children. During that time, she moved to Berkeley, where she worked from home as an administrative assistant. This fall, she'll teach second and third grade at Brookfield Elementary. "I'm here to learn how things have changed in the last eleven years," she said. At the opening ceremonies, guest speaker McDonald was full of pithy advice. "Don't let isolation knock you down," she said. "I have heard of first-year teachers who try to do it all on their own. Don't suffer in silence." Indeed, the corps  which is cosponsored by the district and the New Teacher Project nonprofit  is aiming to build community. In pursuit of this goal, it also organizes social gatherings and provides continuing career support for the teachers in this program, although they are relatively few. The program guarantees positions for its teachers, part of the reason it is more selective than most private universities  this year the corps accepted less than 10 percent of the roughly seven hundred teachers who applied. In return for job placement, training, and resources, the program asks for a commitment. "We specifically look for teachers who want a career here in Oakland," Barrett said. "We don't put a time limit on it. We just say a long-term commitment." This, she added, is because programs that designate a specific length of service typically see teachers exit en masse after their obligation is fulfilled. The corps director hopes this instructional network will keep quality teachers in Oakland's most difficult schools. Although it's far too early to gauge the program's long-term success, Barrett said the corps is proud that 95 percent of last year's trainees have signed up to continue teaching this fall. 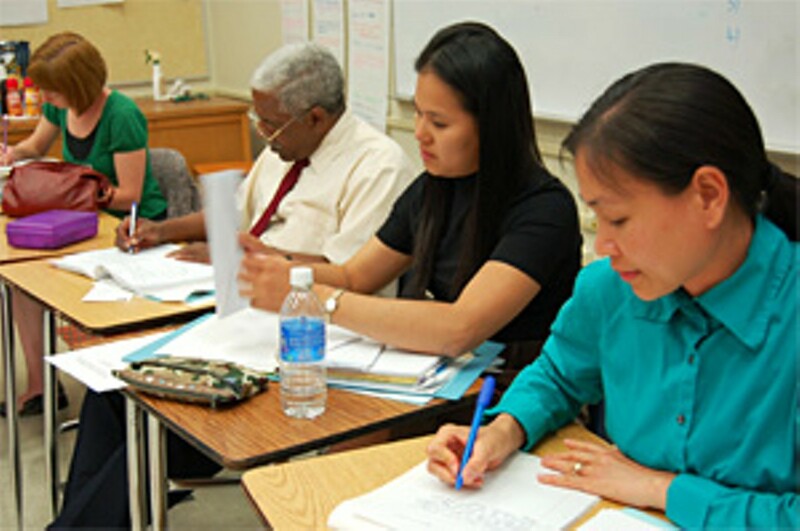 The training itself revolves around the hefty guidebook Teaching for Student Achievement, the New Teacher Project's consolidation of the latest pedagogical techniques and theory, which the trainees were assigned to read prior to last week. In addition to specific skills, the guidebook offers its readers a shared vocabulary that has long been missing from the field. "In the teaching profession, there is a struggle for a common language  something other professions have but we lack," said Barrett, who also directs the Oakland Teaching Fellows, a more intensive program for budding Oakland educators with no previous teaching experience. To an outsider, portions of the training might appear as a mind-numbing exercise in academic process and motivational jargon. Part of the shared vocabulary the guidebook seeks to instill is the mildly humorous acronym BHAGS (pronounced bee-hags). That would be shorthand for Big Hairy Audacious Goals, a term borrowed from Jim Collins, author of business-leadership tomes Good to Great and Built to Last. Both BHAGS and Collins' books featured prominently in a Monday afternoon workshop on "Big Goals." Barrett and Betlach chose goal-setting as a topic because it is typically not emphasized in credentialing programs, Barrett said. For this session, the trainees were split into "homegroups" according to the grade levels they'll teach next year. Each group had a Framework Adviser, essentially a teacher of teachers. In adviser Emily Shaffer's homegroup, Collins' books leaned against the whiteboard as she had her teachers split into groups to revise a sample list of elementary school BHAGS. In one corner, trainee Sheila Nippo discussed with her peers the difference between reading and comprehending sentences, a distinction that became stark for her last year when she taught in a classroom that combined three grade levels. On Tuesday afternoon, the homegroups honed in on "Differentiated Instruction," another core principle. Framework adviser Natalie Cox led her high-school homegroup through the distinction between differentiating "process," "content," and "product" for their students. Taped to a chalkboard board were several T-charts marked in felt tip on large sheets of white gridded paper. One, titled simply "DIFFERENTIATED INSTRUCTION," with headings inviting the teachers to fill in "What it IS" and "What it IS NOT." Above the board hung a motivational sign  one of many  on blue construction paper. "Make the most of your Institute experience," it advised. One might be forgiven for wondering what any of this really had to do with educating children. The teachers, after all, were being taught as though they were students a quarter of their age, but this, apparently, was deliberate. The style is called "modeling"  teaching the teachers as they ought to teach their students  and the program directors insist it's effective. "We use a process-oriented approach to teach a process-oriented approach to teaching. And then we tell them about it," explained Betlach, who teaches seventh-grade immersion English at east San Jose's Lee Mathson Middle School during the school year, as he drew a green triangular diagram on a piece of scratch paper. "We expect these folks to be bringing tremendous content knowledge. We don't want to re-create the wheel," Betlach added, noting that teachers typically receive much subject-specific training from their credentialing program and the school district. Kreutzberg, the former Michigan sub, was excited to model disruptive class behavior. "That was definitely the most entertaining," but the real highlight, he said, was simply sharing thoughts and teaching strategies with his colleagues. Carole Valentino also was impressed. "It was really good for me to see a student's view, and I only hope I can be so effective with my class," she said. "They were just so organized." At least one of the trainees was hoping for something a bit different. At Tuesday's lunch break Kateri Dodds  who will teach English at Castlemont High this fall, after teaching at UPrep last year  said she gleaned much from Teaching for Student Achievement, but found the modeling frustrating. "It moved very slowly," she said, adding that the sessions repeated much of what she had learned in her credentialing program at Cal State East Bay. By Friday's closing ceremonies, however, Dodds had changed her mind. Wednesday through Friday had been modeling-free, and teachers instead chose from among various topical workshops. Dodds liked the sessions on how to set classroom procedures, and the one on childhood cognition. "They were definitely a lot more concrete," she said, as she snacked on corps-provided fruit, cheese, and crackers. "Now I'm all excited and burning with idealism, though that could just be the coffee." An unscrupulous mortgage-collection firm sold Jim Hultman's Berkeley home out from under him, leaving behind a feud and an eyesore. In five years, Oakland has logged 1,538 malicious property torchings but made just 51 arrests in those cases. So much for law and order.